For a pre-Lego Movie feed nearby Cineplex Queensway, I trusted Yelp to lead the way for me. After five pages of, we decided on The Pie Commission, a take-away shop rated 4/5 stars? It must be good! 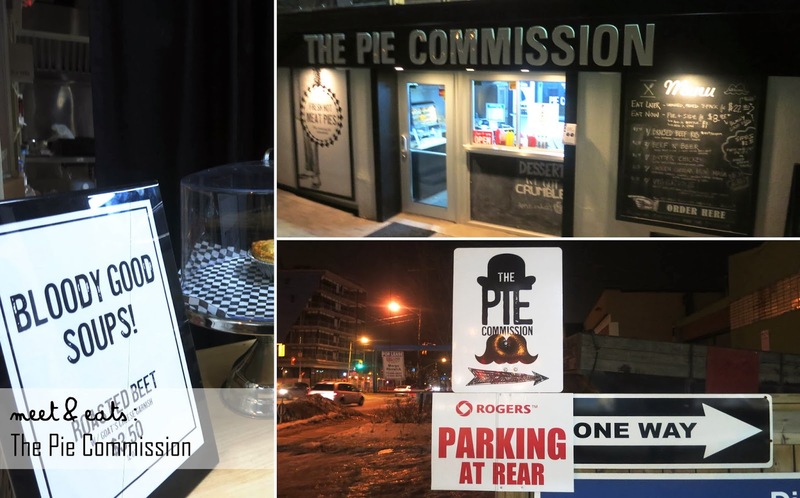 We took a nice walk, following the three signs to The Pie Commision, and arriving at 6:50 with 10 minutes to closing, we quickly made our picks of what to chow on. Happily greeted, they have ‘hot’ and ‘cold’ pies. The hot pies available were only four of the six on the menu, and the cold pies are for takeaway, which is pretty awesome! Pies in-house made, from scratch on a daily. It couldn’t get any more real than that. The deals for a Pie + a Side is a steal! I wish I would have spotted it earlier. I would have definitely gotten fries on the side. Purchasing an Unbaked 4-Pack over the To-go Baked Individual Pies are at no price difference at all, unless you order the (1) Braised Beef Rib or one of their Seasonal Pies. They also have a ‘Soup of the Day‘ available for $3.50. I’m very curious of their Sausage Rolls and Seasonal Pies. I was much more excited for the packaging than anything… And I had a reason to be. 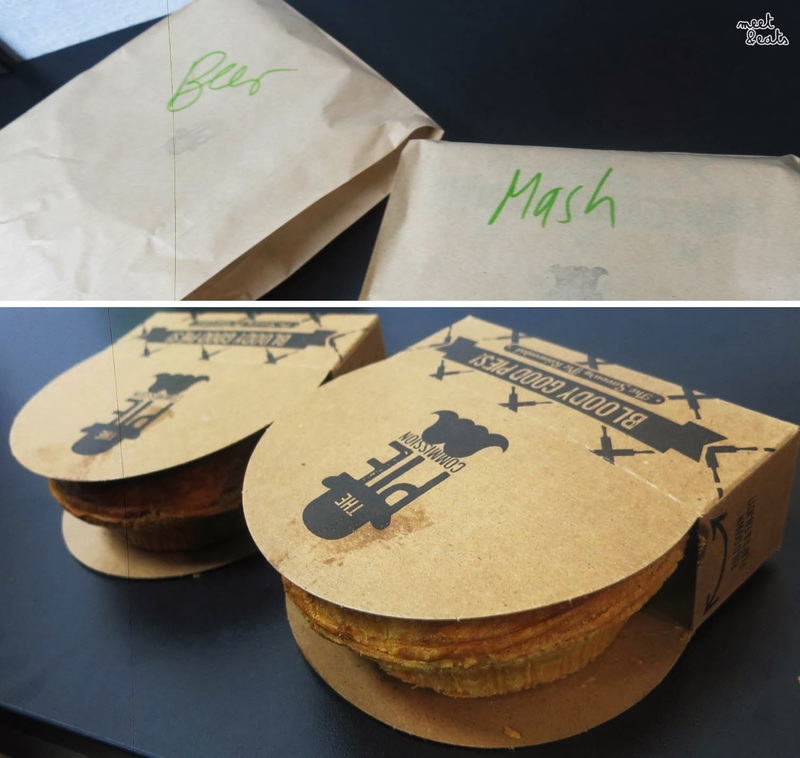 Both of these were definitely a step up from my usual $2.00 Canteen pies in High School. The all-butter pastry was absolutely ah-may-zing. I could eat it all day, I really could. There was also much more depth from the Beef & Beer Pie infused with Beer and Onion. The Chicken Cheddar Bacon Mash made me feel like a vegetarian, there sure were some small pieces of Chicken in there, and zilch Bacon. The amount of Potato Mash wasn’t overwhelming at all, it was the right amount! I really did like the cheesiness and nice flavourful bites of Mushroom, though. 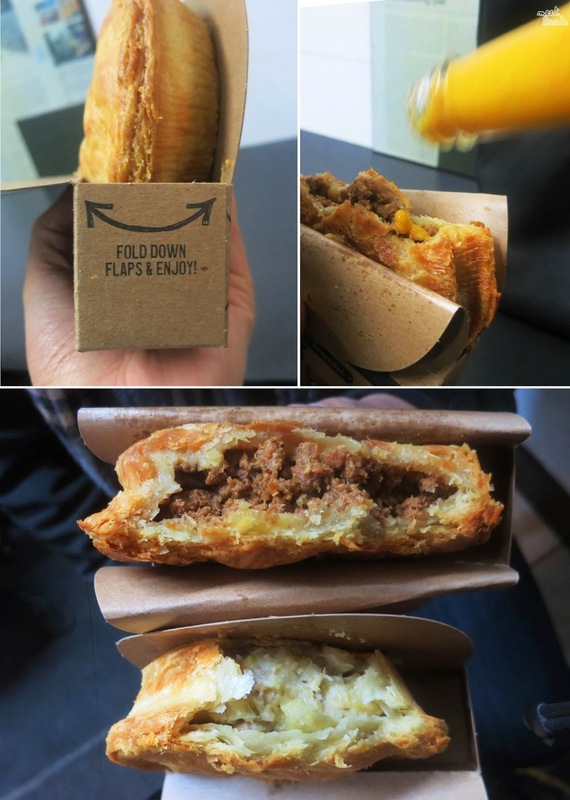 Fold down & Enjoy: Oh boy, oh boy. Look at that pastry. Absolutely buttery and incredible! 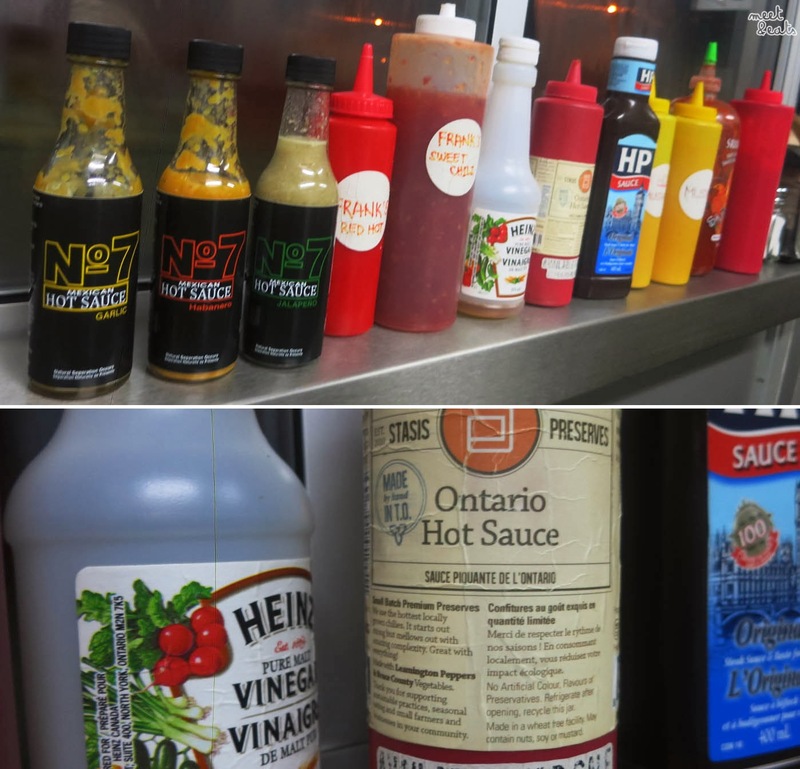 The range of sauces, they even sell this Ontario Hot Sauce in-store! This Hot Sauce tastes a tad sweet, but it’s a very nice flavour which compliments the pies. My favourite sauce with my pie was the Mustard. You cannot go wrong with Mustard! 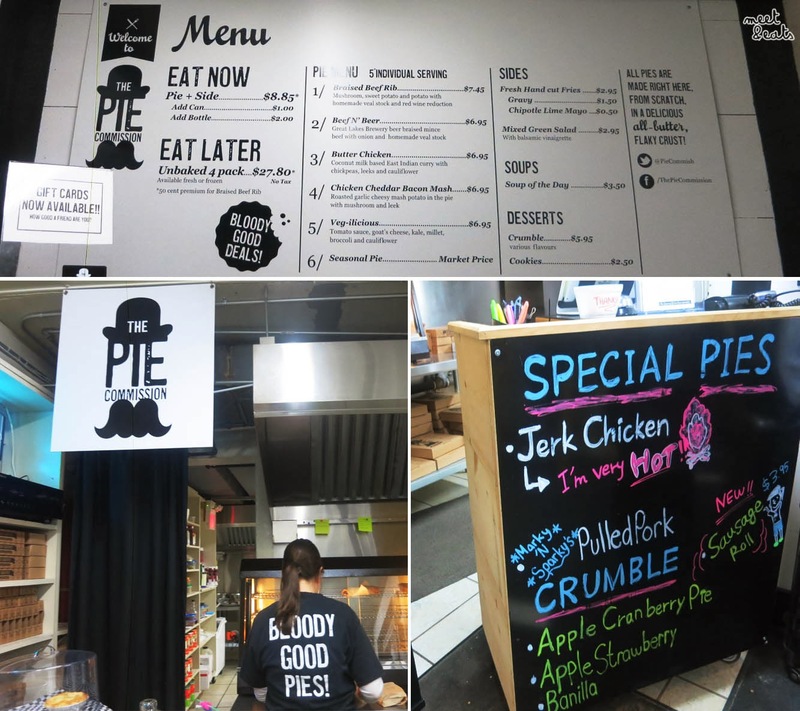 All my disappointment when there wasn’t any Hot Jerk Chicken Pies available, go earlier for the entire menu options! I will definitely be coming back. It is slightly more pricey for a ‘takeaway’ shop, but, you get exactly what you pay for. Each pie was super moist with the right amount of creaminess and pastry of buttery, flakey perfection. I need to try their Sausage Roll, Butter Chicken and I am of course curious about their Braised Beef Rib. It was a m a z i n g! So damn buttery.